So Apple’s last ever keynote at MacWorld has come and gone. And, contrary to the tease mentions by some case sites, there was no iPhone Nano announced. Nor indeed any significant iPhone announcements, rather strangely. As I can illustrate from a chart I drew up for an AAS feature (reproduced below the break), the Apple iPhone is supremely functional in many areas but is let down in others (all well known). In the areas of photo/video and navigation, Apple could have knocked the ball out of the park and really, really rattled the cages of the likes of Nokia. 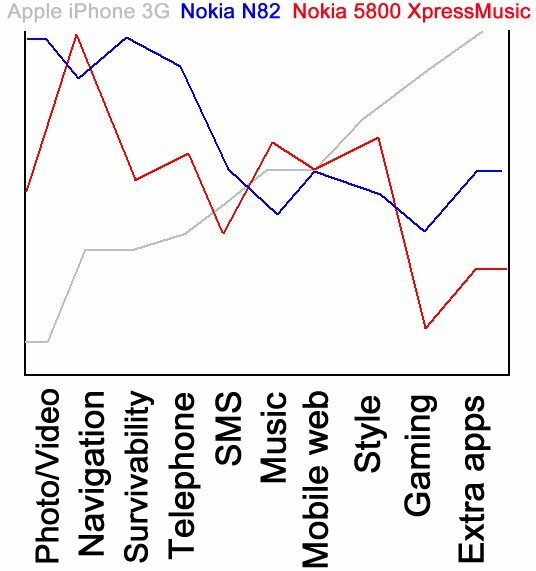 Look at the left side of the chart, where the iPhone is weakest, then look at the grades assigned for ‘Photo/Video’ and ‘Navigation’. What IF Apple were to announce an iPhone 2 with a decent camera? Even a 3.2 megapixel unit with auto-focus and halfway decent optics would be a huge improvement. (A Xenon flash would be the icing on the cake, but I’m not holding my breath for this one). With today’s component costs, such a camera would only cost Apple another $20 or so. But for an iPhone to be able to hold its head up in the company of Nokia Nseries smartphones and to take photos that are at least comparable would be a huge step forwards, in my opinion. Similarly with Navigation. Apple (partnered with Google) are already 80% of the way ‘there’, in terms of finding out where you are, where things are around you and then showing you the way to get to them. The amount of code needed to put in real-time junction advancement and basic voice instructions would be comparatively small, yet it would dramatically transform the iPhone’s capabilities in this area. 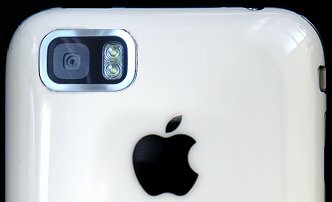 Being able to add ‘Main camera’ and ‘Personal Navigation Device’ to the iPhone’s list of convergence roles would raise its tech profile enormously and remove the main objections to adoption from people already used to the likes of Nokia’s N95 and addicted to its camera and real-time GPS navigation. What reasons could Apple have for NOT doing both of the above and announcing an upgraded iPhone this week? I can’t believe that cost is an issue on the camera front, so it can only be down to Apple not understanding the market. Maybe it’s a European thing, but many people over here use their phone as their only camera. Do Americans all carry separate standalone cams? On the navigation front, I can only presume that there are licensing restrictions involved – note that Google Maps on other mobile platforms also lacks real-time junction advancement. But surely it wouldn’t cost that much to license the appropriate map capabilities, given the amount of profit being generated by the iPhone? Apple, you’ve got me mystified. Nokia, for one, is probably breathing a huge sigh of relief that an iPhone 2 or iPhone HD is still missing in action, meaning that there’s room for its camera-centric, navigation-centric phones to carry on improving their user interfaces and thus sneaking up in Apple’s strongest suit. PS. With an upgraded stills camera should also come video capture, something else inexplicably absent by default from each iPhone. This is 2009 and a bare minimum should be VGA (or similar) resolution capture at 30 frames per second. Just thinking out loud, Apple, y’know….. In my opinion, we will never see more than 1 iPhone model at a time, and we will not see the next one till the summer. There are far more people that want an iPhone than people who want a new iPhone. iPhone current camera sensor cannot record more than 15 frames per second at 320×240 px. Apple would never make a video capture app for a camera that has such a low performance. For the few people wishing for video capture and flash, there are third party accessories and jailbroken apps that do the job.